Update: Marriott has confirmed that you’ll be able to book Cash + Points awards beginning March 24, 2016. A few days ago, Marriott teased upcoming changes to its Marriott Rewards program, with a promise to provide more details this week. One of the “new benefits,” Points Advance, has actually been around for awhile now. The other three changes, however, are actually new. 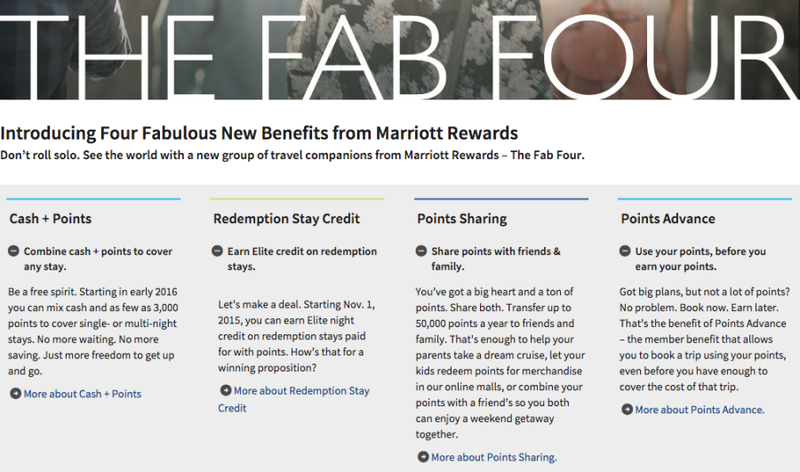 Marriott’s Fab Four program changes. As I mentioned last week, these are all positive changes — you can see the four outlined in the screenshot above. Really, the only addition that required a further explanation is the program’s new Cash + Points redemptions, which let you use a mix of cash and points to cover single or multi-night redemption stays. As you can see in the chart below, the cash and points amounts increase depending on the hotel category (or tier in the case of Ritz-Carlton). However, the increase isn’t proportionate to the full points redemption amount. In other words, the amount you’ll “pay” for each point varies depending on the category. New cash and points redemptions for Marriott and Ritz-Carlton. With a Category 5 hotel, you’ll need to redeem 25,000 points OR 14,000 points + $65. That means you’re offsetting the difference of 11,000 points by paying $65, which works out to just 0.59 cents per point. TPG values Marriott Rewards points at 0.7 cents each, so you’ll end up ahead here. With a Category 9 hotel, meanwhile, you’ll need to redeem 45,000 points OR 28,000 points + $220, so you’re essentially “buying” those 17,000 points at 1.29 cents each, which is a really bad deal. Of course, other programs already offer cash and points redemptions, so ultimately Marriott is playing catch-up here. Still, in some cases it can be worthwhile, so it’ll be nice to have the option when it kicks in early next year.